Hey Folks! I hope everyone is doing well. Last weekend I had the opportunity to travel to Skiatook, Oklahoma, for the first annual Skiatook Adventure. 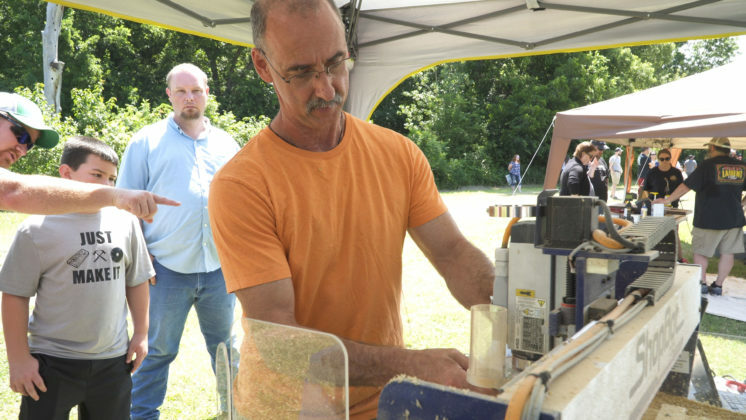 It’s an outdoor woodworking event (not limited to just woodworking) where any creator is welcome to participate and make something in front of or with the help of anyone who shows up to the event. LINKS TO ALL OF THE CREATORS WHO ATTENDED ARE NEAR THE BOTTOM OF THIS ARTICLE. Be sure to check out all of their content! There will always be some level of uncertainty when it comes to any “first event.” But this one was a huge success in my opinion and a personal confirmation (not yet confirmed by the organizing people) that there has to be another one next year. The weather cooperated with us as it was beautiful both days. While I have no clue on the final numbers for public participation I do know that I stayed busy the entire time. Thank you to everyone who came out and introduced themselves and helped! 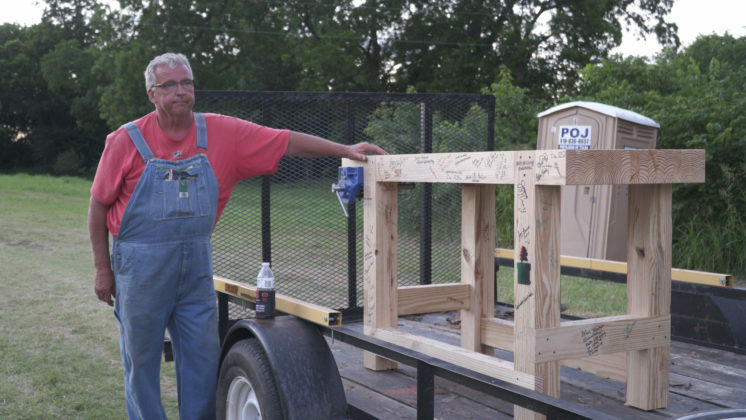 My goal for the event was to build a workbench and offer anyone around to participate. The workbench was based upon the workbench I built for my shop in 2016 except one foot shorter so that it could fit in my truck with the tailgate up. I knew the glue-up stage would be wasted time at the event so I came to the event with the top and all of the base pieces already glued up. That way I can start with the joinery. The legs get two half lap joints on alternating faces for the stretcher pieces. A half lap is also cut on the top of the leg but a little bit later in the day. 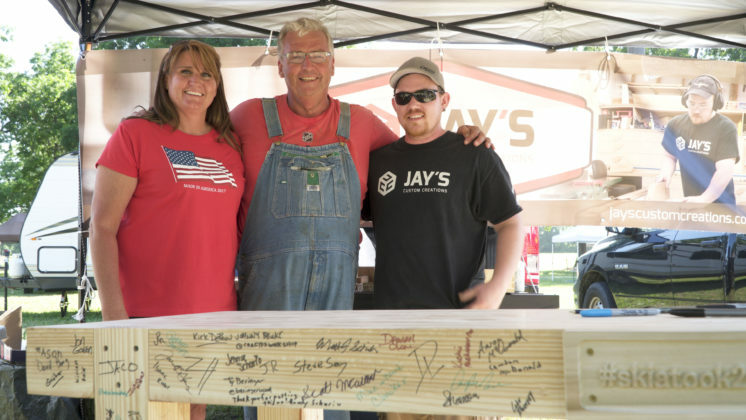 A LOT of people helped with building the bench but two people really put a lot of effort into it. Dylan from Woodbrew was a tremendous help with the leg joinery. And George Vondriska helped a considerable amount when connecting the base to the top slab. 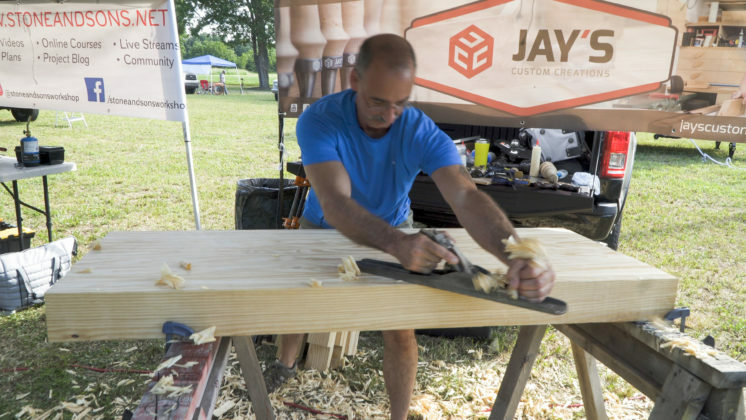 I didn’t get any shots of George working on the base-to-top joinery but here’s one of him doing some hand plane work. He says he’s not a hand tool guy but I think he’s a natural. My original plan was to just complete the workbench wile out there but as day one progressed I thought it would be possible to get the workbench done completely on day one. That way people could sign the base on day two. After the public left Ty Moser cooked for everyone and we all hung out for a bit on a much needed refuel after the day. Shortly after that I went back to the booth and got to work on the leg-to-top joinery with George. We used hand tools for about 97.345% of the bench. A couple hours later a lot of the other creators started to come over and give a hand. 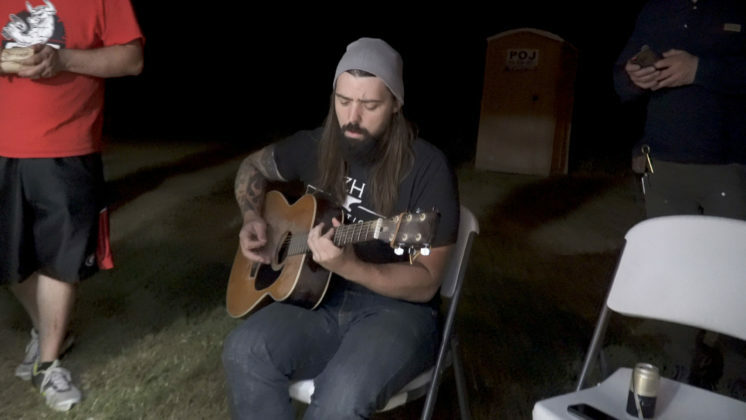 Including some acoustic entertainment. Zach from ZH Fabrications and George Vondriska were killing it on the guitar. We all kept working from 10pm-ish to about 1:30 in the morning. The level of comradery in our online community is great. Everyone wanted to lend and participate despite the late hour. We ended up getting the base joinery, top flattened, top joinery, and major assembly done all in day one. I started working around 9am Friday and finished putting the tools away around 2 am Saturday. “Exhausted” was a common word that night. Gates opened to the public at 9am on Saturday. I got up around 7am and planed all of the base joints flush to allow for everyone to sign it. With the base 100% done I snuck over to George’s booth to CNC a #skiatook2017 tag that I wanted to add to the workbench. George is very knowledgeable with CNCs. 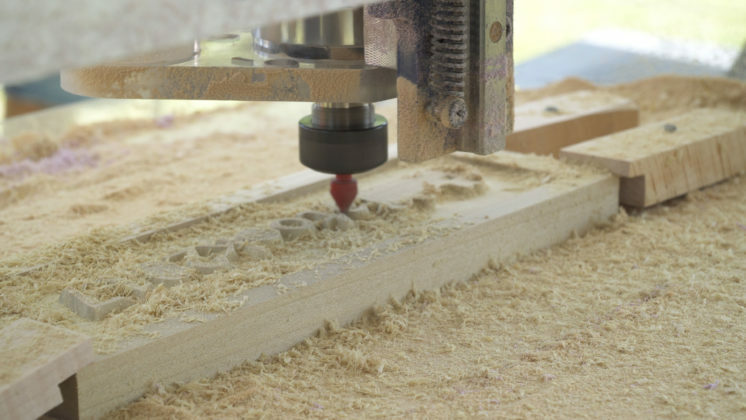 He has a CNC book coming out in May of 2018. One of the best parts of the event was the amount of youth that was involved. Not only did a bunch of kids come to the event but they were all excited and enthused to be there. 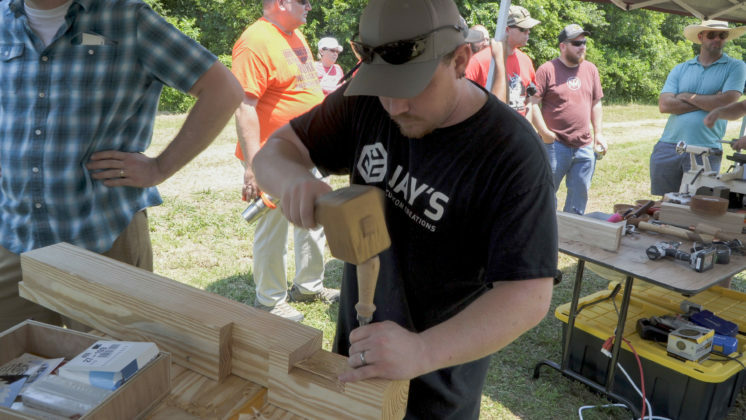 Shawn Stone was turning mallets as well as having kids build their own tool tote in the booth next to me. You never know if the memory you give a kid is the one that gets him/her involved with the craft. Get the youth involved! Finally the workbench was 100% done. 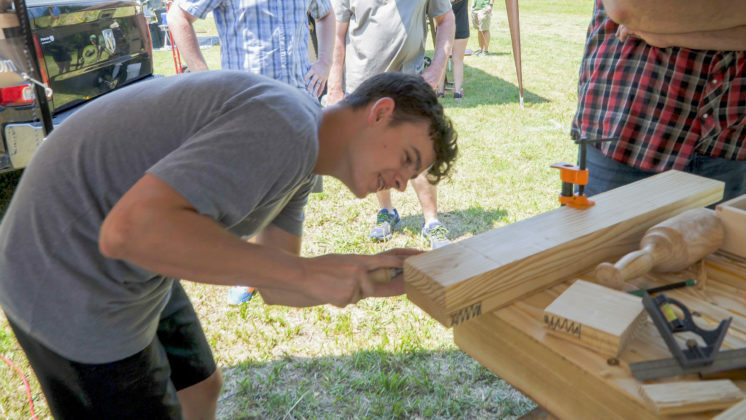 By this time the base was covered in signatures, the #skiatook2017 tag was attached, and the cast iron quick release vise was mounted. 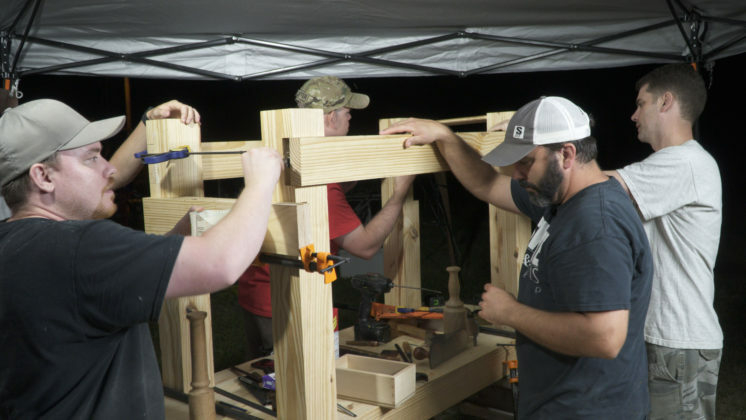 Some time last year Ted Alexander had the idea of getting a bunch of online creators together to mill lumber and hang out. That idea snowballed into what became the Skiatook Adventure. 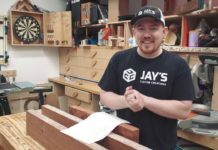 As a way of saying thanks I thought it would be fun to build the workbench and gift it to Ted. Late in day two I did just that and he was very grateful for the gift. 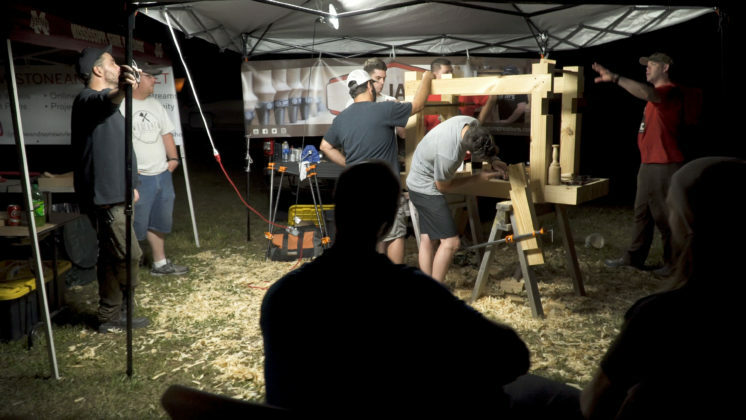 The best part about it was the fact that so many people helped with building the workbench. It was a true community “thank you!” I wish I could have gotten a picture with everyone who helped but by that time people were already leaving. 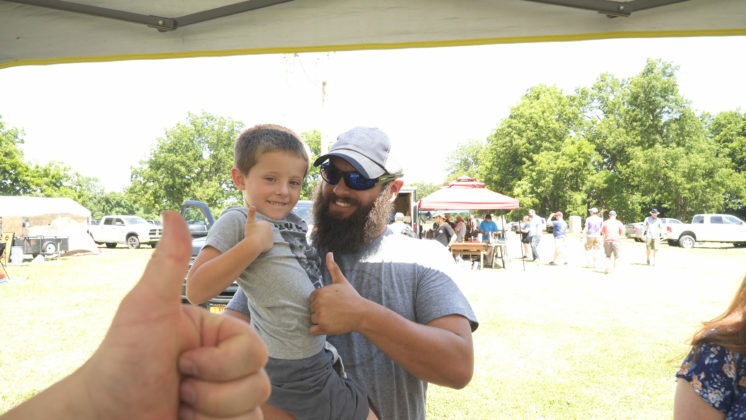 Bottom line: Skiatook Adventure 2017 was a blast. 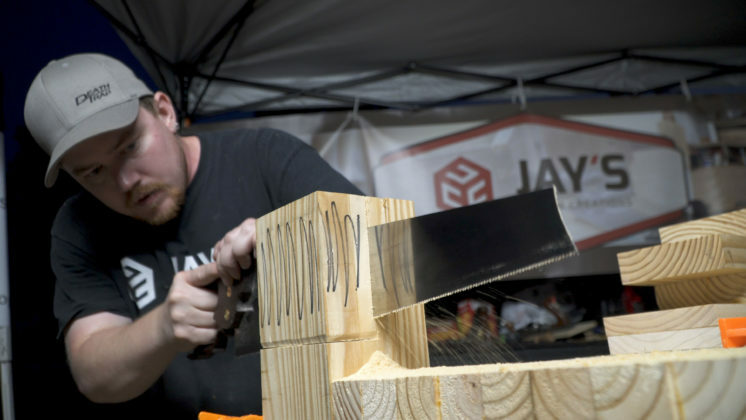 Hands down the best woodworking/maker event I’ve ever attended. There’s something special about a grassroots effort to bring people together in such a small niche community. I’m already excited about the prospect of #skiatook2018. You won’t want to miss the next one! The following is a list of creators who attended. Please notify me if I missed anyone. 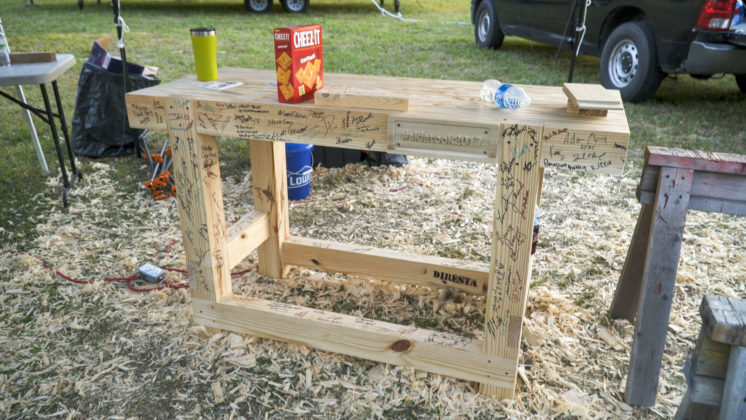 When I first saw the picture of the finished bench, I thought is was made from some type of spalted wood, but then by getting closer to the computer screen, realized it was signatures. It’s hell getting old(er). 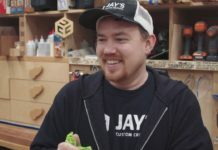 Really enjoyed this video, Jay. Loved the back seat karaoke performance. 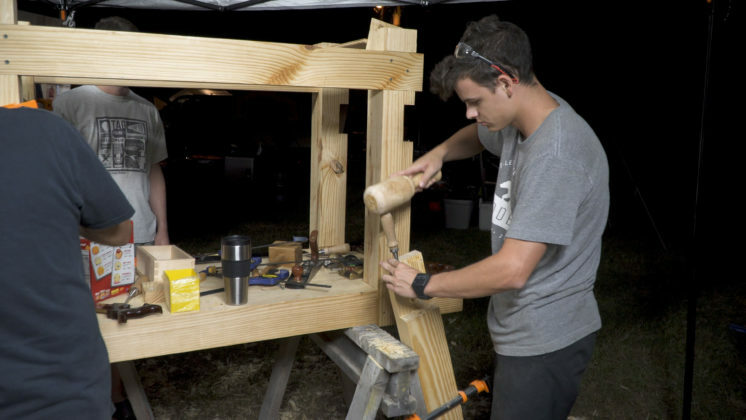 So if I caught that right the only difference with this bench and your other one is that this is a foot shorter and you used half laps instead of through tenons. Is that correct? That is correct. No difference in strength. What kind of “cheap camera” did you use to film this? The quality is very nice. This entire video just made my lunch half hour bearable while being the only person in the office on July 3rd. Great Job all around. In the video I was referring to a cheap flexible tripod thing, not a cheap camera. I used my Sony a6500 with 18-105 lens. check out my resources page for links. I really enjoyed your video Jay and I am a big fan of your videos. Watching your videos inspired me to start woodworking.